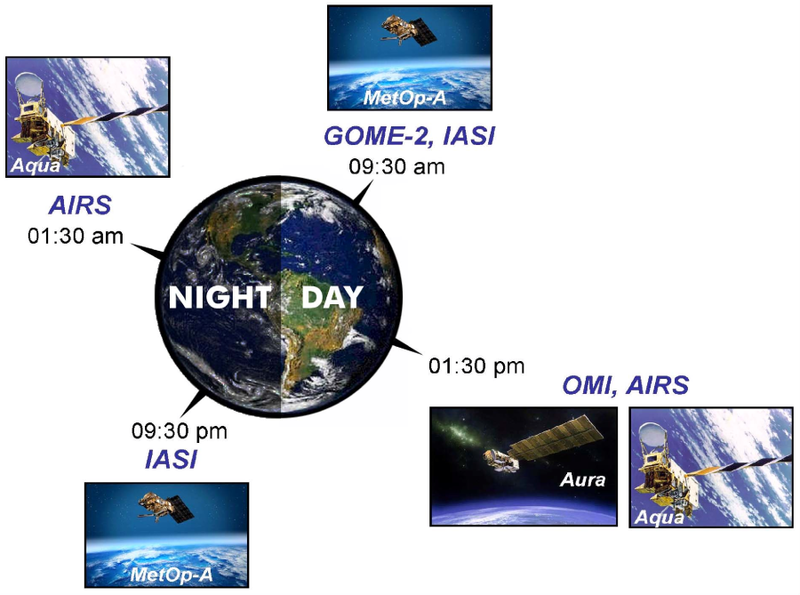 The near-real time process system evaluates satellite measurements from five instruments, three operating in the UV-visible (SCIAMACHY, OMI and GOME-2) and two in the thermal infrared (AIRS and IASI). If the SO2 concentrations are above certain thresholds, an "SO2 event" is detected and a notification is issued by email to users who have subscribed to this service. 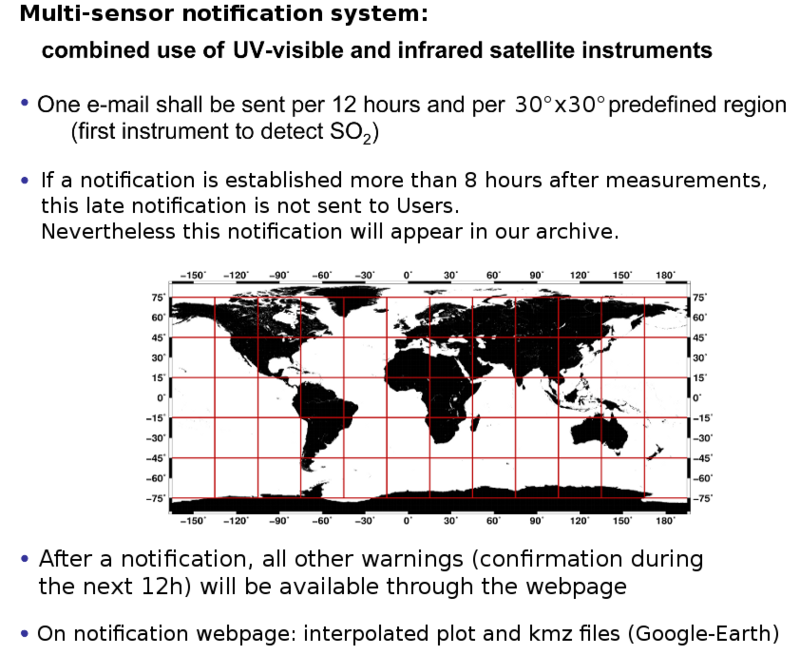 Illustration of the satellites equatorial overpass solar local time. 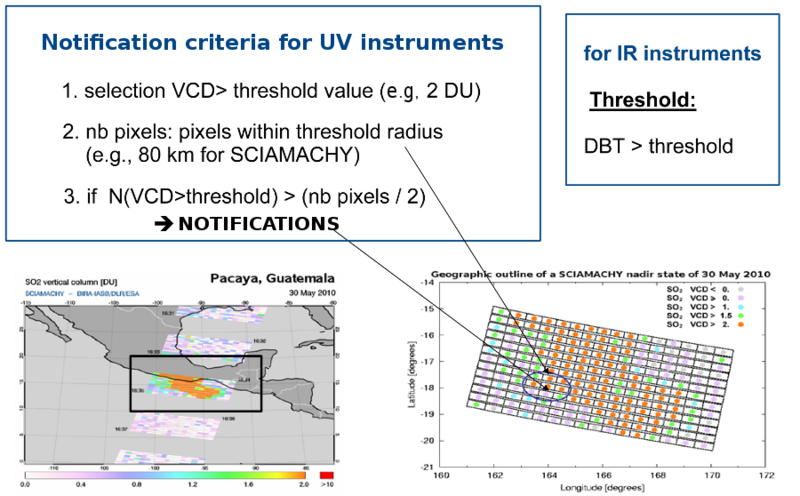 The criteria for the notifications are based on the SO2 total (vertical) density (for UV-visible instruments) and on brightness temperature difference (for IR instruments) of a set of ground pixels. A threshold radius is only required for UV-visible instruments. Considering the surrounding pixels allows to avoid false notification due to noise of the UV-visible measurements. - SCIAMACHY and GOME-2 measurements are also sensitive to the South Atlantic Anomaly. To avoid false notification, strict threshold values are considered for this region. - For UV-visible instruments which are sensitive to SO2 in the low troposphere (between 0 and 5 km), false notifications due to pollution in China, Russia, or South Africa are avoided by considering strict threshold values over these regions. - The OMI instrument suffers from the so-called raw anomaly. To avoid false notifications from this instrument, the data affected by stripes (see for example the SO2 OMI image) are not considered in our notification system. - AIRS instruments is occasionally subject to data anomalies ('line anomaly'). To avoid false notification, a filter is applied. - IR instruments are particularly attractive for the notification system thanks to day and night overpassess and almost no false notifications. However IASI and AIRS are only sensitive to SO2 above around 5 km. This may be a limitation for some users (e. -g., interested by the monitoring of degassing volcanoes). 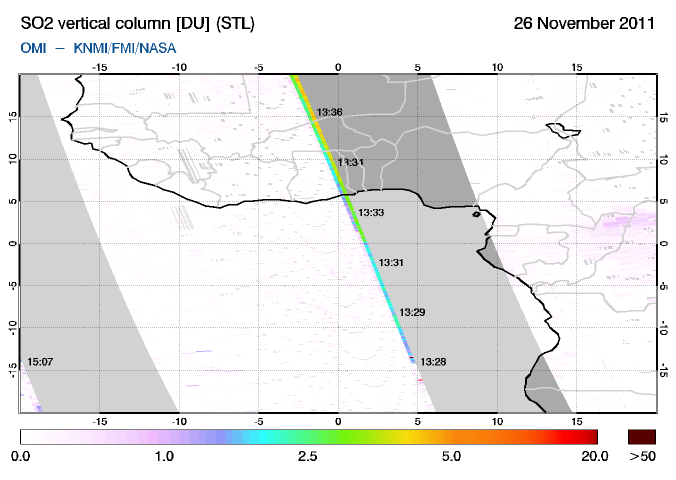 Images of SO2 data (vertical column density in DU for UV-visible instruments, or brightness temperature difference for infrared instruments) and Ash indicators (Aerosol Abosorbing index or ash index). Others plots are shown: Cloud Cover Fraction (CCF) plot if available, SO2 interpolated plot, and a Google Earth file (.KMZ). A plot of the volcanoes in this region and a link to a list and details about on these volcanoes is shown, as well as a link to the near real-time service. During the next 12 hours which follows a notification, confirmations of notification are automatically updated on the notification web page. 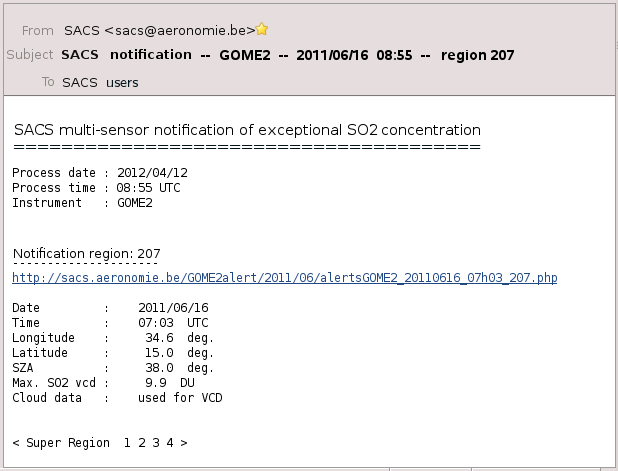 World maps showing the 2011 notifications detected by the SACS multi-sensor approach (please click on the notification points to view the corresponding SO2 images). An update of the SACS archives for all SO2 data is in progress.